Andrew Mason figured out how to inject hysteria into the process of bargain hunting on the Web. The result is an overnight success story called Groupon. At least Mark Zuckerberg wrote a few lines of computer code at Harvard before he left to launch Facebook. 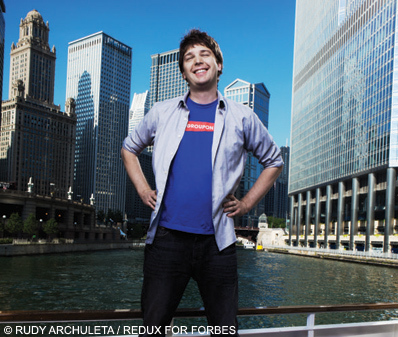 Now Andrew Mason, a relaxed and lanky 29-year-old music major from Northwestern, has managed to build the fastest-growing company in Web history. Groupon represents what the dot-com boom was supposed to be all about: huge sales, easy profits and solid connection between bricks-and-mortar retailers and online consumers. Groupon, a name that blends “group” and “coupon,” presents an online audience with deep discounts on a product or service. Act now, says the pitch: You have only so many hours before this offer expires. That’s a familiar come-on, but it’s coupled with a novel element: You get the deal only if a certain number of fellow citizens buy the same thing on the same day. It’s a cents-off coupon married to a Friday-after-Thanksgiving shopping frenzy. What’s in it for the vendor–which might be a museum, a yoga studio or an ice cream shop? Exposure. Since the resulting revenue is not only discounted but shared (typically, 50/50) with Groupon, the vendor may scarcely break even on the incremental sales. But it now has customers who might never have thought of patronizing the business. Groupon gets its offers in front of eyeballs by buying ad space through Google ( GOOG – news – people ) and Facebook and via the word of mouth of its 13 million subscribers. Unlike so many dot-com rockets, Groupon is a real business. Occupying 85,000 square feet inside a rehabbed eight-story former Montgomery Ward warehouse in Chicago’s River North neighborhood, the company is on track to pass $500 million in revenue this year, according to a report Morgan Stanley ( MS – news – people ) put together to win some underwriting business. No technology stalwart–including Ebay, Amazon.com ( AMZN – news – people ), Yahoo ( YHOO – news – people ), AOL and Google–grew that big that fast. At just 17 months old this April Groupon boasted a $1.35 billion valuation when it raised $135 million, the biggest chunk of it from Digital Sky Technologies, the curious Moscow investment fund behind Facebook and Zynga. (Mason will not disclose his stake, which he says is less than 50%.) The only company to reach a $1 billion valuation faster was YouTube (now part of Google), founded in 2005 and still waiting to turn its first profit. Groupon broke into the black just seven months after inception. Mason’s model is transforming the way companies–especially smaller ones with limited marketing budgets–snag sales. In May Groupon sold 6,561 tickets to a King Tut exhibit in New York’s Times Square for $18 apiece, little more than half the list price. The campaign brought in $120,000 at virtually no marginal cost to the exhibit; Groupon pocketed about 50% for a day’s effort. The most popular item so far: a $25 ticket for a Chicago architectural boat tour sold for $12. In May Groupon moved 19,822 tickets in eight hours and split the $238,000 with the tour operator. Groupon has charged into 88 U.S. cities and 22 countries, including Turkey and Chile. Hundreds of rivals, some with deep pockets, are springing up. With turf wars brewing from New York to Brazil, Mason has armed himself with 250 salespeople and 70 writers, many plucked from the Chicago improv scene, to concoct witty pitches for deals. “We want to do for local e-commerce what Amazon did for normal consumer goods,” he boasts. REIW Australia is part of an established global brand with a portfolio of real estate investment conferences held in Singapore, Shanghai, Mumbai, Tokyo, Dubai, Florida, London, Johannesburg and Sao Paulo.